In line with the upcoming Chinese New Year and also the growing popularity of e-commerce in Malaysia; Shopee, the leading e-commerce platform in Southeast Asia and Taiwan, has observed a 32% increase in the volume of Malaysians searching for items on Shopee throughout this festive period. 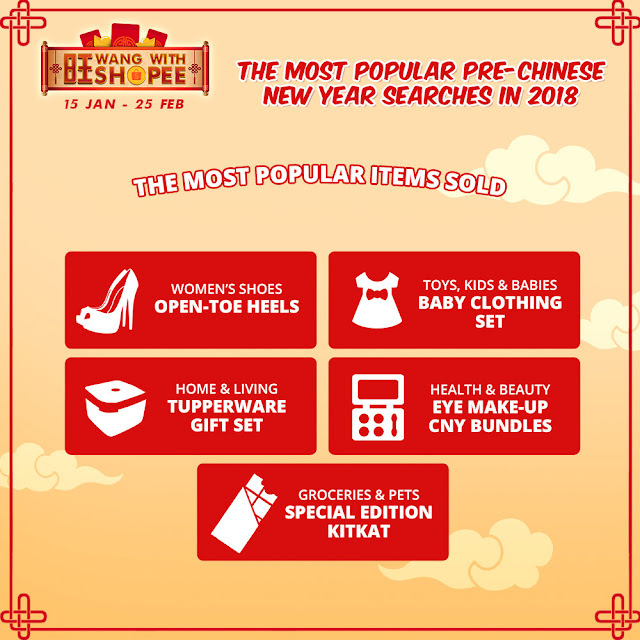 Since the launch of the Wang with Shopee campaign on 15 January which offers discounts of up to 90% and contest prizes worth more than RM1 million, many more Malaysians are turning to Shopee to shop for their Chinese New Year necessities. “Shopping activity usually peaks during periods leading up to festive occasions, and Chinese New Year is no exception. 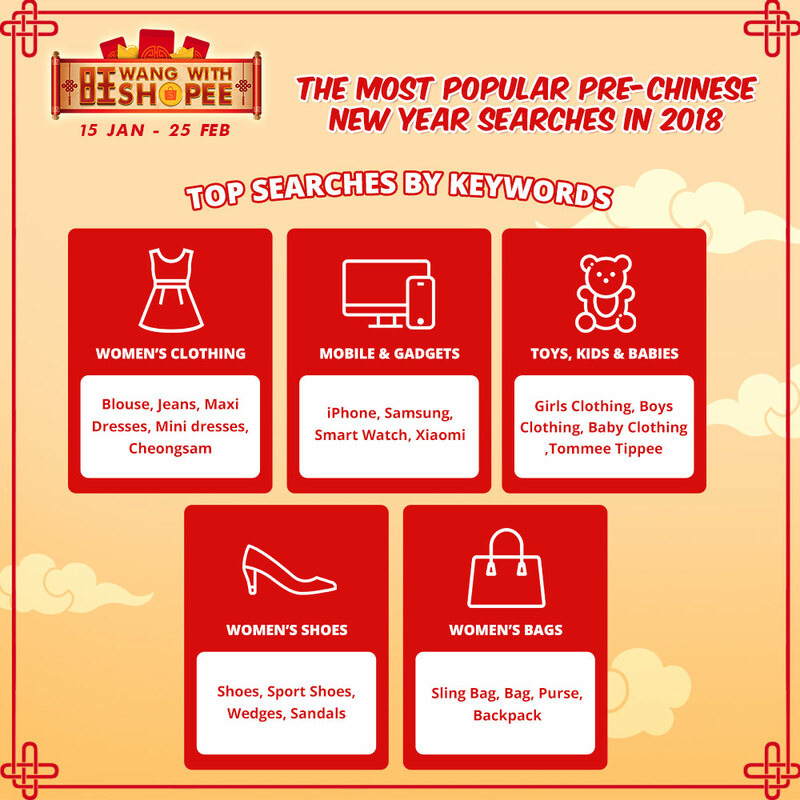 This year, we noticed a huge spike in the number of online searches on Shopee leading up to Chinese New Year, which indicates an increasing trend of consumers opting to shop online for their festive purchases. This is a good sign, and is in line with the government’s initiatives to drive forward e-commerce in Malaysia. Shopee provides users a fast, convenient and secure platform to shop on, and with our Free Shipping across Malaysia and Zero (0) Commissions incentives, Malaysians can enjoy great convenience and cost-savings when shopping with us,” said Ian Ho, Regional Managing Director of Shopee. The most popular Chinese New Year searches in 2018 fall under the following categories: Women’s Clothing; Mobile & Gadgets; Toys, Kids & Babies; Women’s Shoes and Women’s Bags. Enjoy attractive discounts and promotions across a wide variety of products with the Wang with Shopee campaign, which is ongoing until 25 February. With over 6 million products sold by more than 200,000 sellers on Shopee Malaysia, shoppers will definitely be able to fulfill their festive shopping needs. Additionally, users can play the Fortune Ang Pao Game to stand a chance to win Golden Tickets and a grand prize of RM8,888 in cash. Following after, Shopee will be launching the Pay Day Campaign from 26 to 28 February, which will feature even more great deals across leading brands including the Shopee’s Laptop Fair with popular brands such as Acer, ASUS, Dell and Lenovo. Thinking to buy more CNY clothes soon. Will shop at Shopee to get more discount and I love their clothes too. Wang with Shoppee!!! Wang also outflow. hehehe...Shopping like crazy now. Congrats shopee. I suka shopping barang baby dekat shopee sebab harga lagi murah dari online shop yang lain. This year's Chinese New Year is indeed all Malaysians cheaper and livelihood so there's no reason to say good stuff because we're shopping even expensive. Wowwww sebut pasal shopping online ingat shopee. Dengarnya barang kat situ murah-murah ye. apparently people love to shop online during festive season. never forget to spend my time at this shopee platform. my favorite online shopping platform. Love this the most for time being. Oh yess!!! I love to shop at shopee also they have got many good products at a great bargain.